Governor Andrew Cuomo began his third term in office with a speech at the historic site of Ellis Island, where the ancestors of millions of Americans arrived as immigrants in the 19th and 20th centuries. He focused much of his speech not on state issues, but instead on what he sees as the nation’s problems, and said New York will lead the fight against them. Cuomo, who spoke at the site where his own ancestors immigrated to America, says his grandparents were “the people at the southern border today”. The governor says President Donald Trump’s own grandfather, Frederick Trump, also came to this country through Ellis Island. Without mentioning Trump again by name, Cuomo told the crowd gathered in sight of the Statue of Liberty in New York’s harbor that we live in a time of “great global and national unrest”, and said the federal government is committing “malfeasance”, for among other things, shutting down the government. New York State is paying $65,000 a day to keep the two national historic sites open. Cuomo says the greatest threat the nation faces is what he calls a “threat from within”, and the growing divisions among Americans that he says has led to anti semitism, misogyny and xenophobia. The governor says in New York, he will try to remedy some of those ills, with a first 100 days agenda that he calls the most progressive in New York’s history, including expanding voter access, codifying the abortion rights in the US Supreme Court Roe v Wade decision into state law, and stricter gun control and legalizing recreational marijuana. The speech was preceded by a video that could serve as an introduction to Cuomo as a politician, for those who might not know him. 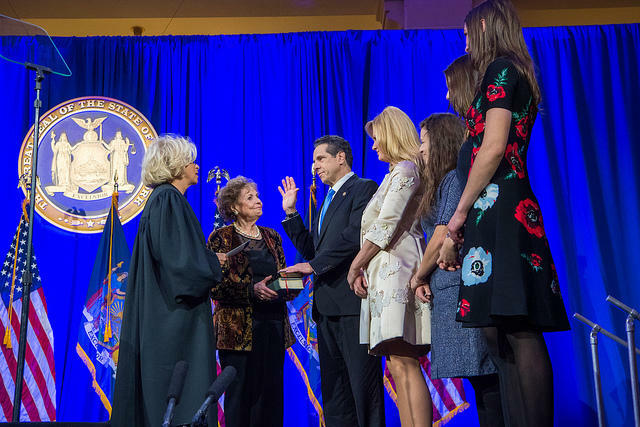 It featured excerpts of speeches and remarks from Cuomo over the past decades, as well as his father, the late former Governor Mario Cuomo, and other family friends. It also included a list of his accomplishments and praise and endorsements from national figures like former President Bill Clinton, who Andrew Cuomo worked for as HUD Secretary, and Vermont Senator and former Democratic Presidential candidate Bernie Sanders. Cuomo has said repeatedly that he’s not running for President in 2020. The state’s next Attorney General, Letitia James was also sworn in. James makes history in two ways- as the first woman and first African American woman to serve as the Attorney General. Former Attorney General Eric Schneiderman resigned last May after allegations he physically assaulted several women that he dated. James promised to crack down on corporate polluters and to further women’s rights, and the rights of the LGBTQ community. She also vowed to go after corrupt politicians. Without mentioning President Donald Trump by name, she alluded to the dozens of lawsuits launched by the attorney general’s office against the President and his business interests. “I will work in a legal system where even the most powerful in the country cannot use a loophole to aovid justice,” James said, to applause. Also sworn in Tuesday night- State Comptroller Tom DiNapoli, who is serving a third full term in office. And Lieutenant Governor Kathy Hochul, to serve a second term as New York’s Lieutenant Governor.